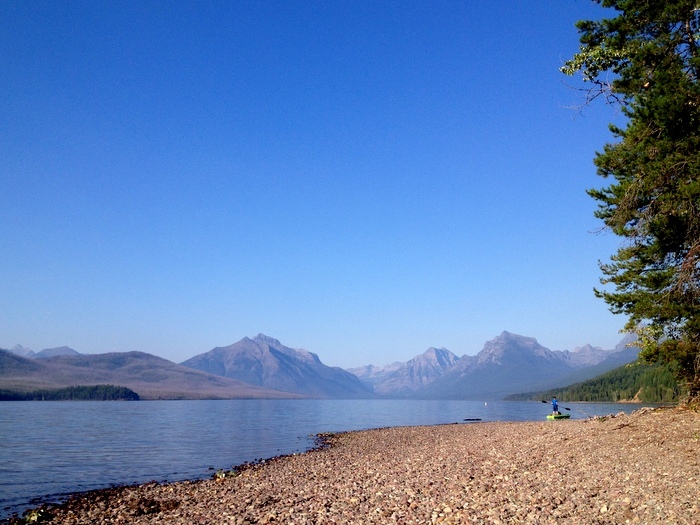 We spent last week at Glacier National Park (the American version this time). 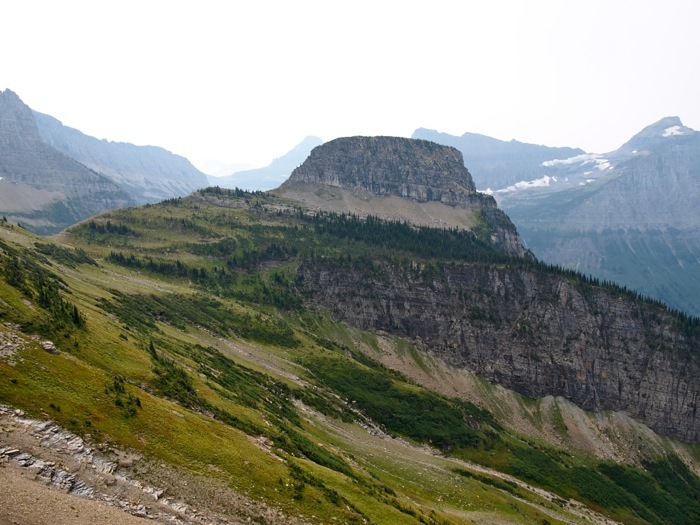 Since the most logical route from Banff back into the US was south through Montana it only made sense that we stop in Glacier. 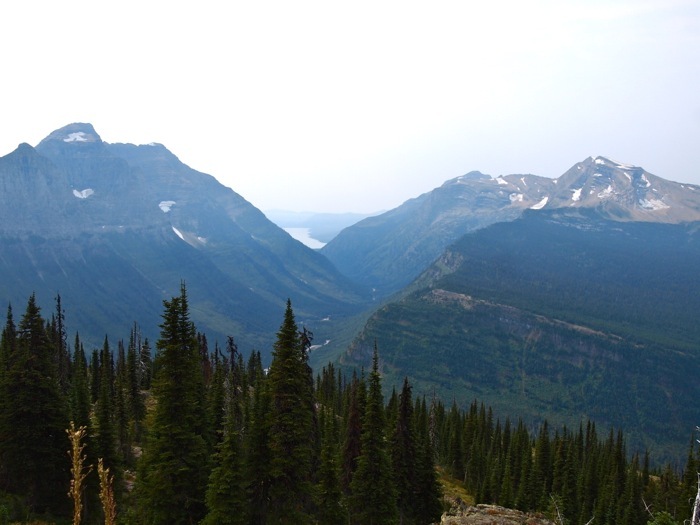 This was our second time around visiting Glacier NP. 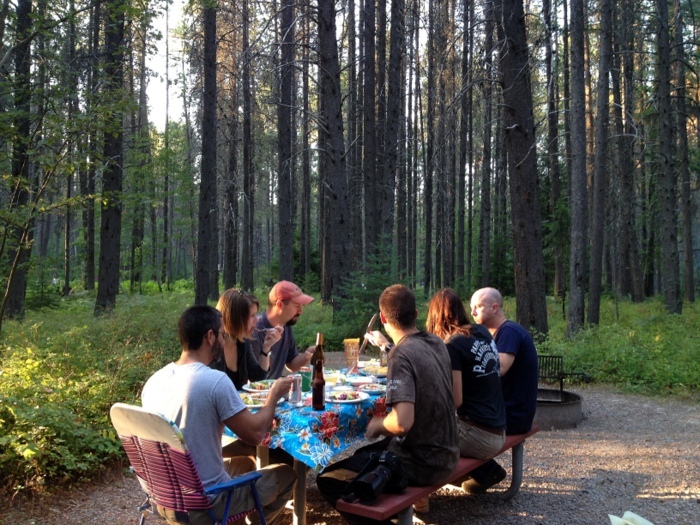 Last year we spent five days in the park at almost the exact same time of year. This time it was a much different kind of experience. Maybe it was because we did so much exploring last year, maybe because we are both working more then this time last year, or maybe because we are a little burnt out from so much sight-seeing in Canada. 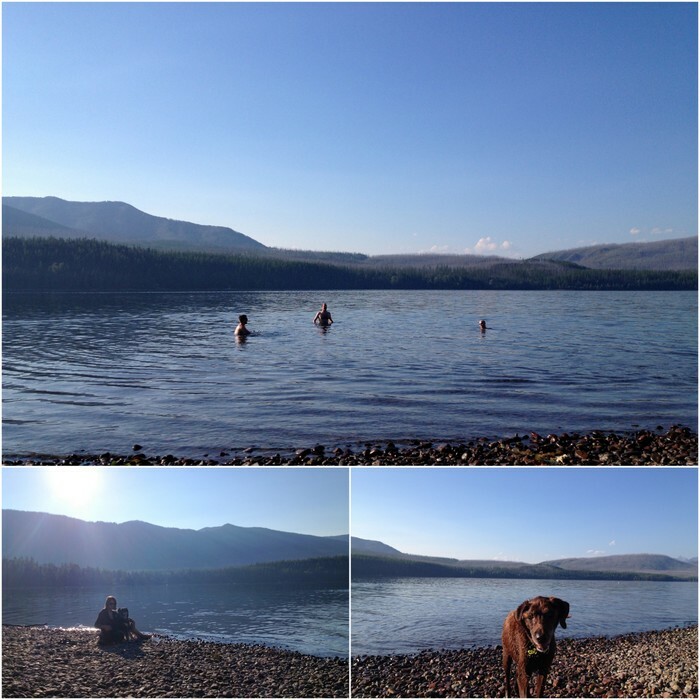 Whatever the reason we had a pretty laid back week with a total of one hike completed, one drive part way up the Going-to-the-Sun-Road, three visits to the shore of Lake McDonald, one so-so meal at the cafe in the park, and one delicious vegan feast with some leftover Airstream caravaners plus a new traveling acquaintance. By far the most ambitious thing we did all week was an astounding 12-mile hike on the Highline Loop Trail. 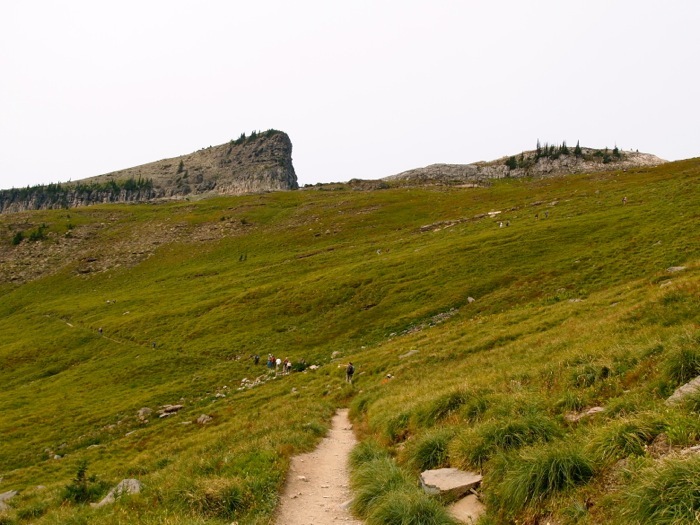 Last year we hiked a portion of this trail and it still remains one of our favorite hikes of all time. 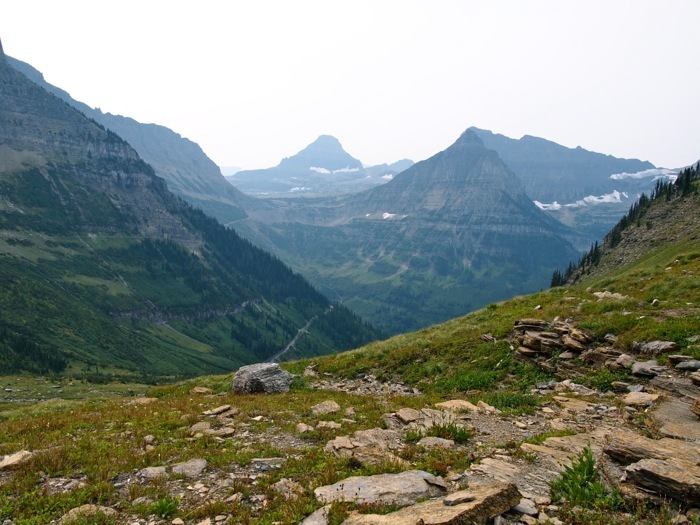 This year we tackled the entire trail by leaving our truck at the Loop parking area, taking the shuttle to the Logan Visitor Center, and hiking back along the ridge and down to the parking area. It was the longest hike we have ever done, but due to the minimal elevation gain was not terribly difficult. 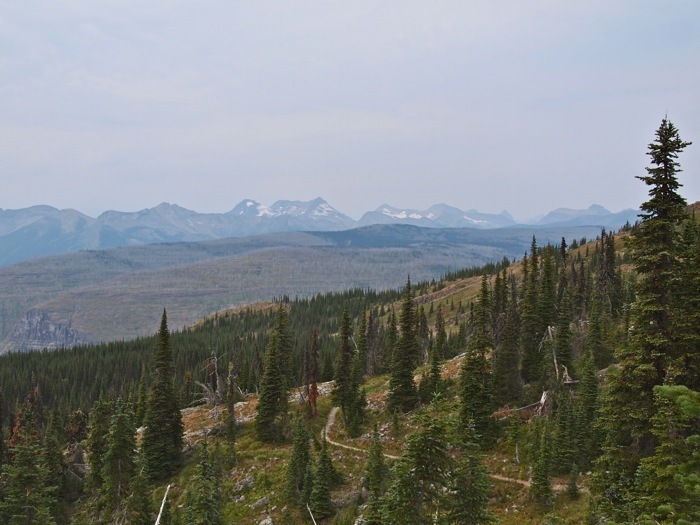 The sky was pretty hazy and the views of the mountains not quite as spectacular as they could have been, but overall it was still an awesome hike with incredible views. 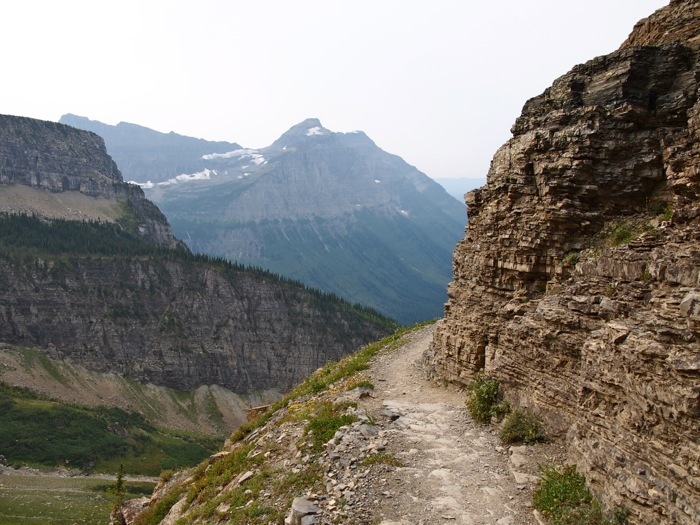 The trail starts high above the Going-to-the-Sun road and treks along an open ridge called the Garden Wall with a slight uphill slant for the first few miles. The steepest part of the trail was a series of long switch backs that lead to what I think was the highest point on the trail. 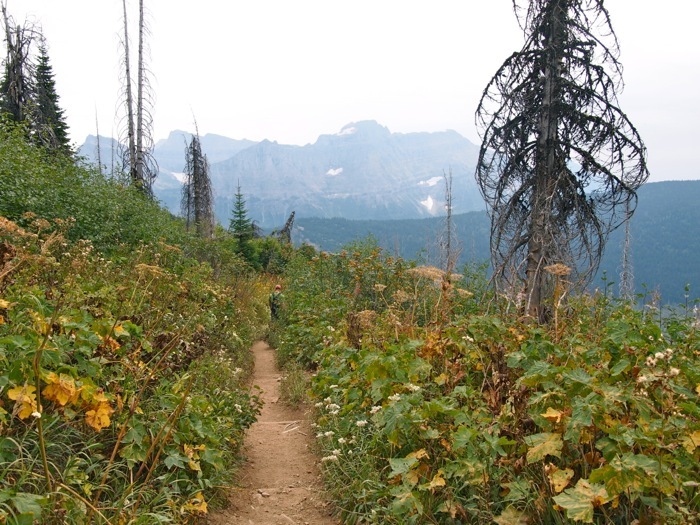 We hiked this trail on Labor Day and it was very, very busy. For the most part the groups of hikers were pretty spread out along the trail, but as people tend to slow on the uphills, this section became kind of congested. You can see the line of people climbing slowly up the switchbacks. At the top of the steep section we paused to look back at the view. This is where we turned and went back last year. This time we continued onward past the mound of rock called Haystack Butte. About 5 miles in we stopped for lunch and enjoyed the view of Lake McDonald far off in the distance. 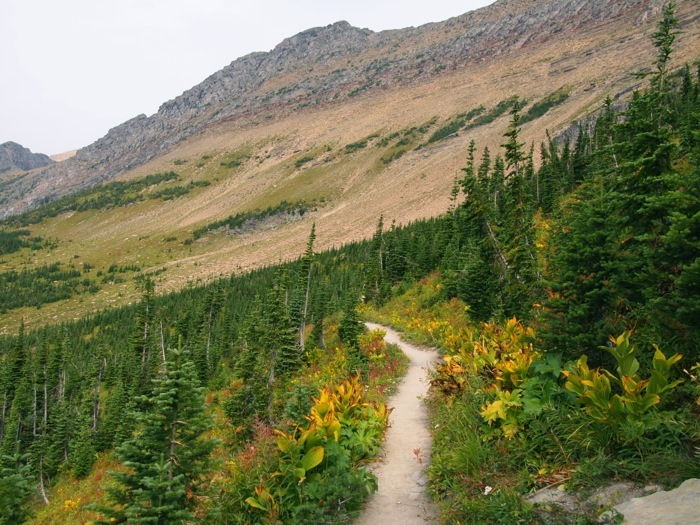 The trail varied from wide open terrain to sections of short, dense evergreens. Even though it was still fairly warm on the second day of September, early signs of fall color could be seen along the trail. 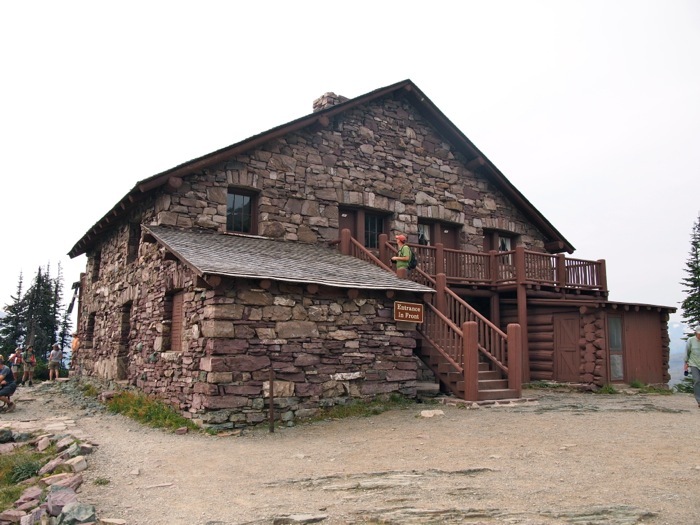 Eventually we got our first glimpse of the Granite Park Chalet. 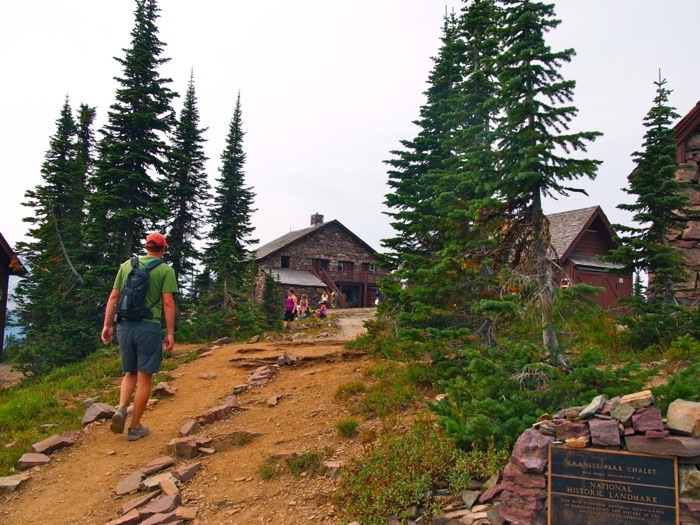 The chalet lies at mile 7.6 on the trail and by then we were ready for a short break. The chalet was built by the Great Northern Railway in 1913 and 1914. Much like the Tea Houses that we visited in Banff National Park, it was originally intended as a rest stop for travelers in the area. Unlike the Tea Houses, there is no restaurant, no chocolate cake for sale, and no tea. There is a small concession area though with a few snacks and drinks for sale. The chalet also has a rooming house where you can stay for a night or two. It’s a very popular destination and they recommend making reservations a year in advance! I can imagine that on a clear day the view from the chalet is outstanding. We left the chalet and followed the trail another 4 miles down to The Loop parking area. This was actually the most challenging part of the hike. It was fairly steep the entire way down and our legs and feet were very tired. 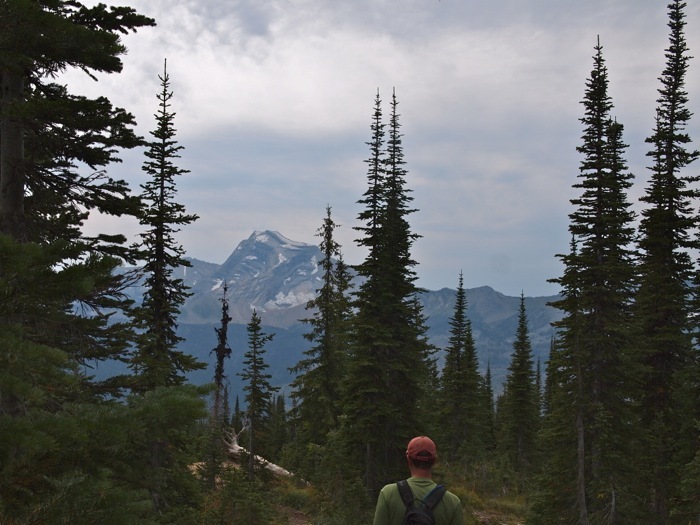 The trail started in a forested setting with occasional views of the mountains beyond. 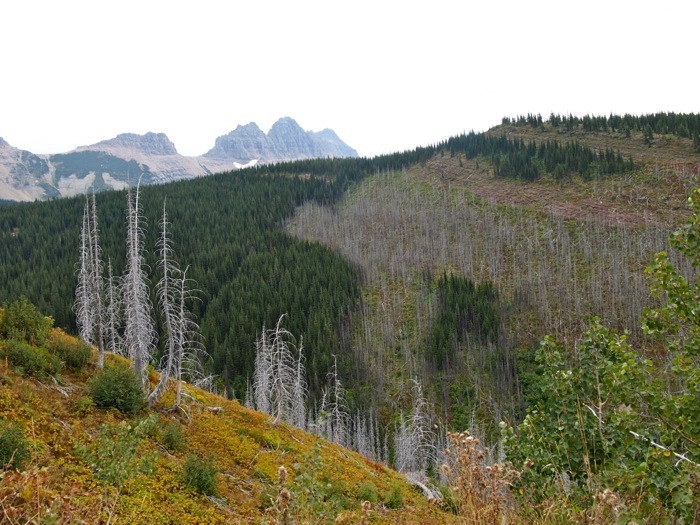 After a mile or so the forest disappeared and we hiked the rest of the way out in the open. Much of this section of the trail travels through an area that burned in 2003. You can see the scars left from the fire. We arrived back at the truck tired, happy and with an incredible sense of accomplishment. Considering we only made it out for one hike all week, I think this was the best one we could have chosen. All in all it was another great week in another great national park. That was some hike…the longest we have done is 8 miles. I find the beautiful views serve as a distraction for tired feet! That is interesting about the chalet…staying there overnight would be fun. Your blog is “colliding” with Laura’s from Riveted today! 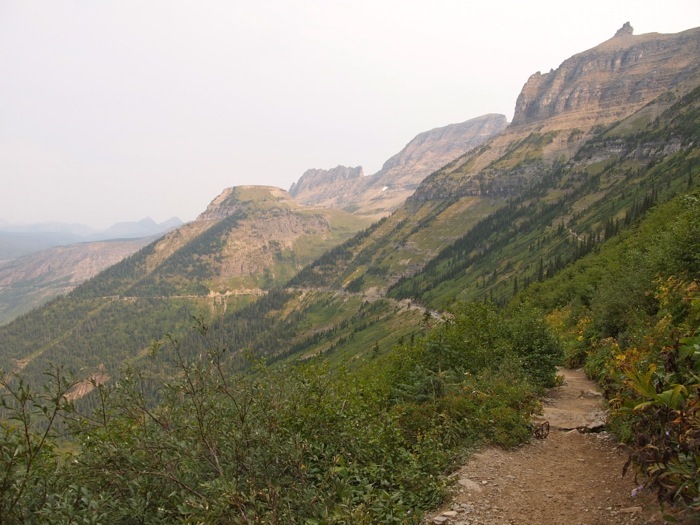 She has very different photos of the same trail, http://www.riveted-blog.com/2013/09/highline-trail-at-glacier-national-park.html. The fog in hers makes it look like a risky hike. I know isn’t that funny? Part of the trail is actually a bit risky. Near the start there’s a skinny section high on a cliff above the road. I think that’s where her fog photos were from. I didn’t post any photos of this part of the trail because I had a bunch from when we did the hike last year. 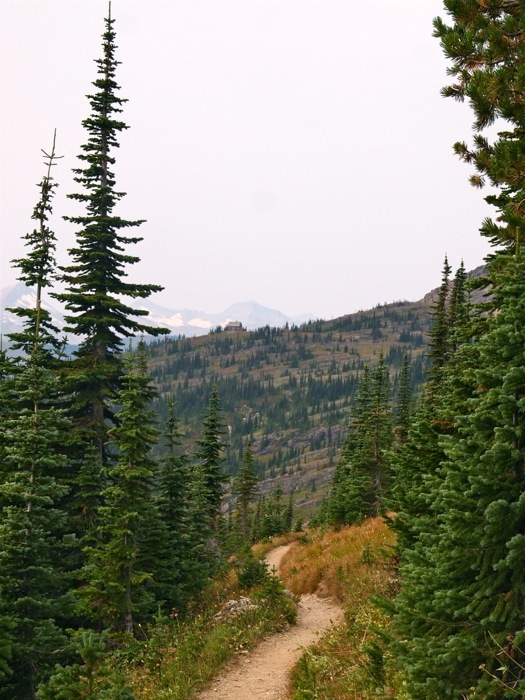 I love how in high in the mountains the same trail can look so different depending on the weather. 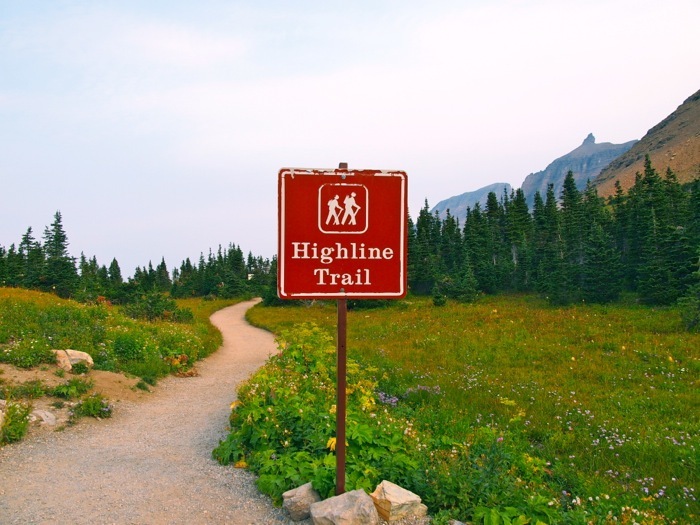 Oh, now I wish I had hiked the Highline trail… I’m still nearby, so maybe I still will. Oh you should! 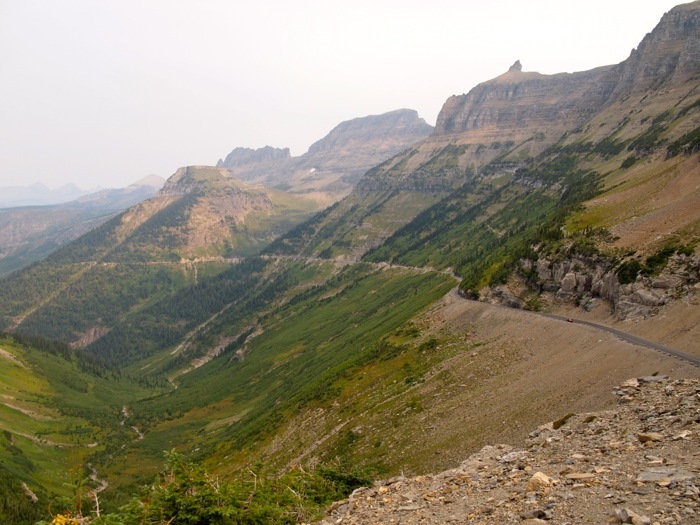 Even if you just hike the first section from the Logan Pass Visitor Center to Haystack Butte and back you would love it. Especially if you have some blue skies. It was nice to meet you. Hopefully we cross paths again. Too bad we missed you. I think we were so exhausted from our previous weeks traveling with others folk that we forgot to look you guys up (even though I now remember coming across your blog awhile ago). We may cross paths again this fall in the Mojave Nat. Preserve either on our way to or from Lake Mead at the end of November. We spent a few days in the Mojave last year and absolutely loved it!